^ a b Eknoyan, Garabed (2008). “Adolphe Quetelet (1796-1874) -the average man and indices of obesity.”. Nephrol. Dial. Transplant. 23 (1): 47–51. PMID 17890752. ^ Keys, A.; et al. (1972). 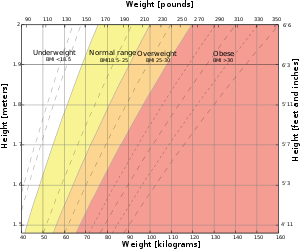 “Indices of relative weight and obesity.”. J. Chronic. Dis. 25 (6): 329-343. doi:10.1016/0021-9681(72)90027-6. PMID 4650929. ^ a b Berrington de Gonzalez A (December 2010). “Body-Mass Index and Mortality among 1.46 Million White Adults”. N. Engl. J. Med. 363 (23): 2211–9. doi:10.1056/NEJMoa1000367. PMC: 3066051. PMID 21121834. https://www.ncbi.nlm.nih.gov/pmc/articles/PMC3066051/.